Seated left to right: Charles Glasgow, Deputy Director, Labor Relations MTA; Arthur Maratea, National Vice President, TCU-IAM. Standing left to right: Ralph Agritelley,Vice President Labor Relations, Metro-North; Michael Hale, FST ARASA TCU-IAM Lodge 5091; William Mills, General Chairman ARASA TCU-IAM Lodge 5041; Paul Constantinople, Local Chairman TCU-IAM Lodge 227; William DeCarlo, National Representative TCU-IAM Unit 167; Andrew Paul, Assistant Director Labor Relations, Metro-North. Fresh on the heels of reaching a breakthrough contract on Long Island Rail Road, TCU negotiators on August 18 negotiated identical agreements for Clerical and ARASA (MofE) members on Metro-North Railroad. The agreements provide for more than 18% in compounded wage increases over a six and a half year term. The wage increases are retroactive all the way back to January 16, 2011, including overtime. The substantial back pay amounts will not be reduced by retroactive employee contributions to health care, a major improvement over the recommendations of two Presidential Emergency Boards on Long Island. The agreements have none of the work rule concessions that Metro North management demanded over four years of deadlocked negotiations. Going forward there will be employee health insurance contributions equal to 2% of 40 hours straight time pay, again less then what was recommended by two PEBs. Current employees will continue to see their 3% pension contribution end after ten years. The agreements contain the first ever me-too provisions on Metro-North. The agreements were negotiated by National Vice President Arthur Maratea, National Representative William DeCarlo, and ARASA General Chairman William Mills, assisted by ARASA Financial Secretary-Treasurer Michael Hale, and Clerical Local Chairmen Paul Constantinople and Rod Fasion. The ratification period ends September 5, 2014. Click here to see the ARASA (M of E) tentative agreement. Click here to see the ARASA (M of E) ratification letter. 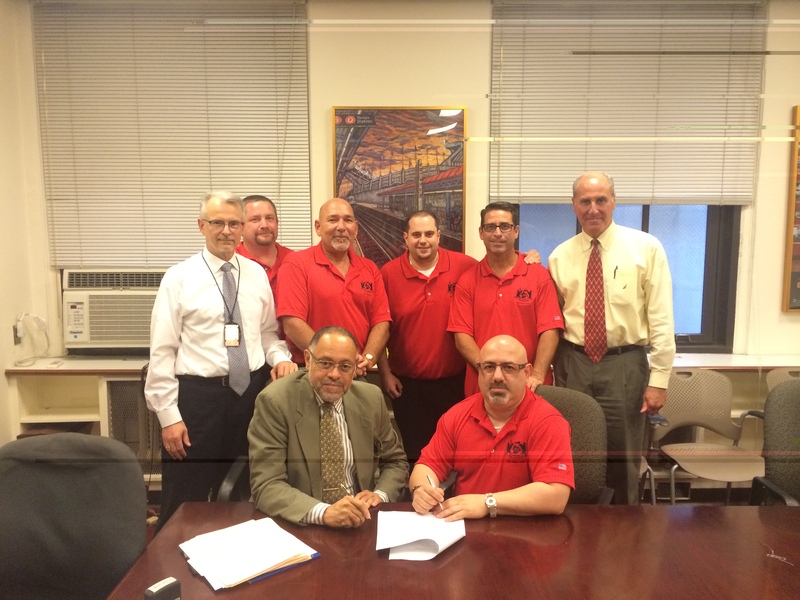 Click here to see the Clerical tentative agreement. Click here to see the Clerical ratification letter.